This elderberry wine recipe produces a true country wine. Rich and deep toned, reflecting the summer concentrated into the hedgerow fruit. It’s simple and easy to make, just follow the instructions and you can’t go wrong. The recipe is easily adapted by altering the sugar content to make a dry, medium dry or medium sweet wine. Strip the elderberries from the stalks and wash well. If you immerse the berries in cold water for a few minutes, any hidden insects will float off. Put into a fermenting bin and crush. A traditional potato masher is ideal for this. Pour on 4 pints of water. Add 1 Campden tablet, crushed and dissolved in a little warm water to kill off any wild yeasts. Boil half of the sugar in 2 pints of water for 2 or 3 minutes and, when cool, mix into the pulp. Add the yeast and nutrient and cover and allow to ferment for 5 days, stirring daily. Strain and press and return the liquor to a clean fermenting bin. Boil the rest of the sugar in 1 pint of water for 2 or 3 minutes and, when cool, add to the liquor. Pour carefully or syphon into a gallon jar, leaving as much deposit behind as possible. Rack, as necessary, and add 1 Campden tablet after the first racking to stop fermentation. This elderberry wine recipe produces 1 gallon of rich red wine that should be stored for at least six months after bottling before drinking. made this few years back – lovely and deep red . You could try making it without the Campden tablets but using them is safer. Looking at it, if you add the initial 4 pints of water boiling rather than cold, that should kill off any wild yeasts. The second tablet could be omitted but watch out for fermentation re-starting. Yes, there are more recipes to put online when I get chance. I used to add Campden tablets to kill off wild yeasts years ago but decided to experiment with using the natural wild yeasts. Almost all fruits have plenty of natural wild yeasts adhering to the skins. I found they work very well and I never need to buy wine yeast anymore…just allow the natural ones to do their work! They say the wild yeast can give an off flavour, but I’ve never noticed it. The wild yeasts are perfectly adapted to the fruits they settle on…why buy yeast when nature gives it free? It takes longer for them to begin to ferment…sometimes 4-5 days but they always start eventually. I use a lid with an airlock on my fermentation bin, so I don’t need to worry about air or flies getting to the juice. I also often leave the bin fermenting for up to a month before syphoning into air-locked demijohns, to extract maximum flavour from the skins. As regards Campden tablets(which contain sulphites), I don’t use them at all. I like my wine fermented out dry, so never need to add anything to the bottles of wine to kill yeasts. I do use sodium metabisulphite for sterilising equipment but always rinse out thoroughly. I’ve never had a problem with spoilt wine since using a lid with an airlock on the fermenting bin..highly recommended and available to buy in most homebrew shops! One thing I always do now is check the strength of my wine using a hydrometer before and after fermentation, using a special formula from the internet. I’d hate to buy or drink a wine without knowing the alcohol content. Alcohol% = [(OG minus FG) divided by 7.36] x 1000. So if OG (original gravity) = 1.080 and FG (Final Gravity) = 0.990(typical value), alcohol% = [1.080-0.990/7.36] x1000 = 0.09/7.36 x 1000 = 12.2%. That’s about the right strength for my taste. If I add a Campden tablet at the initial stage to kill off any wild yeast, will it not then kill off the wine making yeast ? Hi Terry – the sterilising effect falls off quickly with time. Allow 24 hours between using and adding yeast. I have a steamer/juicer that I just used to get the elderberry juice. It’s concentrated and I have a gallon or more. Would this work to make elderberry wine? Put the elderberries into a 5 gallon fermentation bin, just enough water to barely cover them and then whizz them up with a paint stirrer on an electric drill. The centrifugal force removes them from the stems in 30 seconds. Don’t go over this time as the stems will start to break up. Strain the berries through a coarse plastic garden sieve to remove the stems and you can process them in the usual way. Fermentation time is variable being affected by a number of factors. Basically simple though, when it stops bubbling and the airlock stops the glug glug noise. If in doubt, give it more time. Racking is just shorthand for syphoning the liquid out of the demijohn and leaving the ‘sludge’ behind. Sometimes you need to do this a couple of times – allow time for the solids to settle out each time. Hi, what is the additional water at point 10 for please? To make it back up to the gallon. Just put my wine in demijohn for fermentation, but no bubbles have appeared yet. When adding the yeast I only used one sachet as amount was not specified in recipe was that enough? Yeast is living – in ideal conditions the number of cells doubles every 8 hours. It’s not like sugar or water with a fixed quantity. So, it’s usual to add a sachet but you could use one sachet to make 2 or 4 gallons. Possibly the wine is too cool, which will slow things down considerably – 20 to 24 degrees C is perfect. Too hot when you added the yeast – this will have killed it off. Old / duff pack of yeast. Hi, I bought some winemaking equipment on eBay there were some yeast sachets included but I don’t know how old they are does it matter? Also what would be the alcohol content in this recipe and is there a way to make it strong? Yeast – could be good, could be dead – try one in some sugar water and see. Could be a strong wine – depends. If you want it really strong do what Grandad did and add some vodka at the end. This is my first effort at making this wine. It seems to have stopped fermenting after only a week. I thought it would be going for longer than that. Do you think it’s ok? Thank you. Wyn, this doesn’t sound right to me. Perhaps too cold? I’d have expected it to ferment for 6 weeks. Hi,This is my first try at using fresh elderberries, and managed to collect more than I thought. What changes would be required in the recipe for a five gallon batch? To make 5 gallons you need 5 times the fruit and sugar. A little more yeast nutrient but shouldn’t need more yeast as it will multiply. When making elderberry wine (or any fruit wine ) I always freeze them as I am led to believe hot water is not called for (a) is that true (b) as it’s frozen I did not add a Campden tablet at this stage. Will it be alright? ps My wine making lodge is cold but I wrap lots of warm blankets around to help with slip fermentation. I have quite a few frozen berries that I am ready to make wine with! Any special instructions. I look to make maybe 10 gallons and would hate to mess it up? Because of the freezing action damaging the cells you’ll find crushing should be easier. Might be a bit messier stripping stalks if you didn’t do it before freezing. 10 gallons!! Can I come to the party? Oh Mon, what are you like? Wine yeast – you eat bread, drink wine. Trust me, wine yeast. Hi John, thank you for this recipe. Followed nearly to the letter. Mashed mixed and brewing part one. Its been on for 5 days but is happily bubbling away still. Do i strain, press and add more sugar whilst its still fermenting or leave it to stop bubbling? I have followed your recipe exactly to the point of fitting the airlock, that was 24 hours ago and has yet there is no sign of fermentation starting (no bubbles. I used a small sachet of wine yeast, is that enough? if it persists how do I start it off? Please read the comments where this question has been asked and answered before. Yeast, being a living thing reproduces and doubles its number every 8 hours or so. If bought in sachets, use the whole sachet otherwise a teaspoon full will be fine to get things going. Yeast nutrient: unless the packet instructions say otherwise, a small teaspoon full will be plenty. You can omit yeast nutrient but I’ve found better results from using it. The fermentation gets going better and lasts longer. I’ve included a small amount of elderberry in a blackberry/dewberry blend before with great results. This year I collected and cleaned enough for a 6 gallon batch of elderberry only. Pain in the rear to destem and remove all unripe. ATT 18 pounds in freezer waiting to be fermented. Am I being too cautious removing most of the threadlike stems and few green/red berries? Many mentions of cooking the berries to remove any toxic effects. Is there any need to cook or just use them raw? 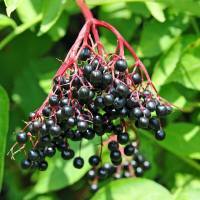 Need to mention – elderberries are from south US that are black when ripe. I don’t think you need be too thorough about removing stems and the odd green or red berry. Don’t worry about cooking them for wine. would adding pectolase into the must be beneficial and also would you add finings to clear it? I don’t think pectolase would be beneficial as elderberries are naturally low in pectin. I’d only use finings if the wine fails to clear. Ive made several batches of fruit wine this summer… Blackberry is lovely, even before maturing, strawberry sounds lovely, but is quite awful! Rather than tip it, I am hoping to disguise the flavour by mixing different berry wines together. Any hints on which flavours might improve the strawberry? Also your recipe seems to use about half the amount of fruit other recipes use. Are elderberries particularly strong, or can i double up the fruit, and only the fruit, for a really full bodied plonk? On strawberry wine – I don’t know about blending it but my experience is that a young wine that tastes awful can taste far better a year later. As for altering the recipe, give it a go if you wish. I’m all in favour of playing with recipes.. sometimes it works out brilliantly, sometimes not. Thanks John. I used about 1.5 times the amount of elderberries, so we’ll see! I’ll relocate the strawb wine to the attic once it’s cleared, taste it in a year – and hope you’re right! I started 2 demijars a week ago. Identical methods/temperatures/sugar/yeast, etc. Standing side by side, so temperatures the same. The grape wine is doing fine, but the elderberry wine stopped working 2 days ago. If I agitate it, I get a few bubbles, but then it settles again, and everythng stops. Any advice please. thank you. Hi Rose – Grapes and Elderberries are different. I think your grapes have more sugar so more fuel for the yeast. Did you follow the recipe above or a grape recipe? Hey, I’m making the elderberries wine. I have it in the fermenting bin 4 days but there’s no activity. I did have a lid on the bin but removed it today. Should that make a difference or should I add more yeast? Hi Guy – I don’t see that ginger will stop it fermenting. When to add it, your guess is as good as mine. Let us know what happens. Hi I made the elederberry wine and added cinnamon sticks and a few cloves, hope they add to the flavour. If the sugar is added in two stages, how do I get the accurate gravity reading for the final calculation of alcohol % ? I’ve used up the berries from my bushes but found a source that will sell me raw elderberry juice. Any idea how much juice I should use for a gallon? Perhaps try it with 2 pints of juice and reduce the added water?